U.S. #966 honors the dedication of the Palomar Mountain Observatory, home of the 200-inch Hale telescope. Located atop Palomar Mountain in southwestern California, the Palomar Observatory houses the Hale telescope, one of the world’s largest optical telescopes (meaning it collects and focuses visible light). Named after the astronomer who planned its construction, the Hale telescope has a 200-inch mirror. 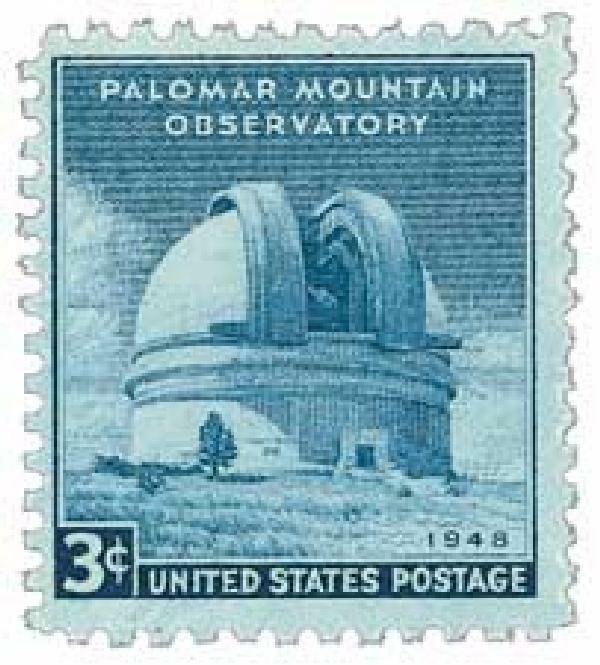 Efforts to create the observatory began in the 1920s, and Palomar was selected as the site for the observatory in 1934. However, the Hale telescope was not made operational until November 18, 1947. Quasars, extremely bright objects located at the center of other galaxies, were first detected using the Hale telescope in 1963. The energy from quasars takes billions of years to reach the Earth. Because of this, information about quasars helps scientists learn more about the nature of our universe. The observatory also has several smaller telescopes. One of these, the 48-inch Ochin telescope, specializes in making wide-angle photographs. This has been useful in mapping the northern sky and creating a reference “sky atlas” for scientific use all over the world.